An UK bicycling magazine. Articles, forum, tests, workshop, routes, race calendar, race results, ads. The routes are especially interesting and include East Anglia, Northumberland, New Forest, Hampshire, Kent, Peak District, Hebridean Islands, West Cork in the Republic of Ireland, Wales, Cornwall, and others. Journey planner, timetables, today's rail travel information, train operating companies, travel bureau links. An UK bicycling magazine. Forum, bike tests, kit tests, ``grime time'' (articles about preparing for races, pedal repair, suspensions, etc. ), sport, videos, ads, events. Bike shops in Bath, links, magazines. La bici è un modo per scoprire le meraviglie naturali che arricchiscono le Alpi e l' Appennino, ed è sembrato giusto presentare una finestra abbastanza ampia (in collaborazione con Apt, Pro Loco e Privati) sulle varie località trattate. La parte di utilità ciclistica raccoglie ciò che interessa ad un appassionato: recensioni sulle riviste e sui nuovi prodotti delle aziende che collaboreranno con noi, mercato dell'usato, opinioni, link per i siti delle gare ed altro ancora [...]. [P]roponiamo itinerari per conoscere e visitare i colli ed i monti del Nord Italia. La descrizione degli itinerari trascende le tecnicità dei cicloamatori professionali proprio perché vuole rivolgersi a tutti, come una guida turistica. Ma ovviamente con le note della descrizione e con l'ausilio delle mappe, disponibili ormai per metà degli itinerari proposti, anche i più ``preparati'' possono affrontare l'itinerario con tutte le notizie necessarie. This site offers a wealth of information about cycling in Veneto. BiciVeneto is a homage to my two greatest passions: bici *(bikes, short for biciclette), and the Veneto region of Italy, my adopted home. It's an apt combination, because contrary to the common perception, all of Italy is not cycling crazy, and there are, in fact, regions where you will not encounter many cyclists at all. The Veneto, on the other hand, is a land of generations-old cycling heritage and traditions, and bicycling in all forms is a way of life. If you ask the Veneti why this is so, they will answer that cycling is a tough sport which demands hard work, stubbornness, and sacrifice, qualities which are an integral part of their character. The Veneto is arguably the most ``cyclistic'' of Italy's 20 regions: There are an estimated 25,000 licensed riders, belonging to several federations (in a population of 4.4 million). Questo sito si rivolge a chi ama organizzare i suoi viaggi per conto proprio, fuori dalle rotte del turismo di massa, senza acquistare ``pacchetti preconfezionati'' da tour operator od agenzie di viaggio. This site is for those persons who like to plan their travels by themselves, out of the road of mass tourism, not inclined to buy something ready made from big tour operators. We have brought back the classic web pages dedicated to the genius of the eccentric British cycle commentator David Duffield. From accounts of Duffield racing his tricycle from John o'Groats to Land's End to stories from his days following the Tour de France and providing daily coverage, you'll find it all here. The only web that is 100% dedicated to e-bikes in Spain. All the information someone needs for e-bikes in Spain. The museum of applied arts Vienna has been founded in the year 1863. The building itself has been erected in the years from 1868 until 1871 by Heinrich Ferstel in cooperation with the art historian Rudolf von Eitelberger. At this time the museum bears the name of “r;k&k Museum für Kunst und Industrie“. As it has been the first museum of Vienna's Ringstrasse, the museum has been known as a prototypical of many art museum in Europe. In the years 1875 until 1877 a further wing has been added, which has been as well under the direction of Heinrich Ferstels. At 1907 widened the architect Ludwig Baumann the present complex to a further wing in the style of the Italian Renaissance at the side of the road 'Weisskirchnerstrasse'. The exhibition has been combined with exhibits from the Italian artist Enzo Mark. 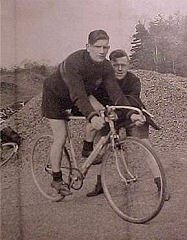 The exhibition itself has been a sort of summery of various bicycle collections. Some interesting for me, some not. You may look at the following pictures and judge by yourself. Enjoy the pictures. Good luck to our followers! The tour started near Vienna's 'Russian memorial monument' at Schwarzenbergplatz. Took us all the way to the 'belt street' (Gürtel). We hit the old railroad station 'Westbahnhof' and have been riding back to the town center. A fun tour, in order to promote bicycling... Even Vienna's police has been smooth like velvet. I felt like in San Francisco... Enjoy the pictures. Good luck to all our followers! A fun Tour inside the city of Vienna. This event has been sponsored by British folding bicycle manufacturer. As Heide has one from this brand, she couldn`t be stopped to participate. Very hot weather conditions made it a very sweaty tour over paved and unpaved roads. Three rounds round the 'Lusthaus' at Vienna's Prater. In total just nine Kilometers... Heide has been recognized as the first women at the arrival. Enjoy the pictures. Good luck to all our followers! I heard about this easy going mountain bike competition. As it has been so nearby to our home, and some bike friends pushed me to participate, I did so... A wonderful ride with the chance to meet a lot of new bike comrades... Enjoy the pictures! Good luck to all our followers! Every year, we are going to Grieskirchen. All participants from the bike club WHC Voesendorf. All of them retired. Still going strong. Enjoy the pictures! Good luck to all the followers! Every year, we are going to test our shape. All participants from the bike club WHC Voesendorf. All of the retired. Still going strong. Enjoy the pictures! Good luck to all the followers! Rail services of the Austrian national federal railway company OEBB have seriously deteriorated the last few years. There are no direct connections to France, Belgium, Netherlands any more and the rest is a fragment. On domestic connections passengers suffer from delays, overcrowded trains, bad service and all sorts of unpleasant experiences including overcrowded trains cleared by the police. Most important for tourists with bicycles is that in 2010 most of the trains that still had bicycle capacities were robbed of the luggage van. Un viaggio in solitaria attraverso l‘r;europa occidentale ed il bacino mediterraneo un percorso che vuole esprimere un messaggio di pace ed integrazione. Fine ultimo del viaggio una missione: raccogliere fondi da devolvere ad un ente benefico che sviluppi piani di cooperazione mirati a soddisfare i requisiti minimi di sussistenza in popolazioni sottosviluppate. Sono lieto di invitavi a visitare il sito dell‘r;opera di Maurizio, li troverete tutte le delucidazioni tecniche, il calore dell‘r;Africa, e l‘r;energia emanata dal sig. de Romedis, Maurizio detto ICIO. A short, concise explanation of how you can travel around France with your bicycle. A site made for people who are thinking about cycling in sunny Languedoc, France. There are many great cycle routes of all lengths, as well as useful information on what it is like to ride in Languedoc. Each route page has a Google Map, route description, directions, and photos. Routes can be searched by region, difficulty or distance. Beside bicycling, we tried a hike, which is not so far from our home... Destination: 'Trefflingfall' located in Lower Austria. Reachable via train 'Mariazellerbahn' (a 'narrow rails track' train)or by car, following the Hwy 39 from St.Poelten on. Passing little towns like Obergrafendorf, Kirchberg, Loich, Winterbach. Right in the middle of the village 'Puchenstuben' one has turn right a downhill road to the 'Trefflingfall'. A sort of hidden place. Safe to go. A lot of safety ropes surrounds the hiking path down to the river fall. Worth to go! Enjoy the pictures! Good luck to all the followers! Corvara, has been the starting point of several 'Maratona dles Dolomites', I have been participating. We said: we do the Sella Ronda in winter. On Snow board. The tour takes just 4 hours (if you are lucky on queues before the lifts...). Worth to see the little city of Arabba, just before the Porte Vescovo. We made a side trip to the Marmolada (there are two ways of correct spelling: Marmolada and Marmolata - one is in local language 'ladinisch'). Enjoy the pictures! Good luck to all the followers! These will be the longest single stage mountainbike races in Europe. Teams have 24 hours to complete 250km courses. A collection of photographs and anecdotes from my father on cycling in the late 1930's and 1940's. Racing, touring, pass-storming, you name it, they did it - usually on fixed gear, and wearing corduroy shorts - ouch! No chamois leather for these boys.